The board games hobby is a great passion but it is also a pass time that can be rather expensive. There are a lot of great board games out there, and if many of those have a price tag of $50 to $100 or even more, you would be wrong to think that a board game must be expansive to be good. In fact, there are tons of cheap board games that are fantastic and totally deserve to be played as much as the more expensive board games. If you are looking for an excellent board game but don’t want to spend too much money, have a look at my list of best cheap board games. The following list is made of board games under $40, board games under $30 and even some under $20. Why are board games expensive? What makes a board game expansive is the quantity of components that compose the game, and their quality. The more you have components in a game, the more raw material you will need. And the price of the board game will rise accordingly. 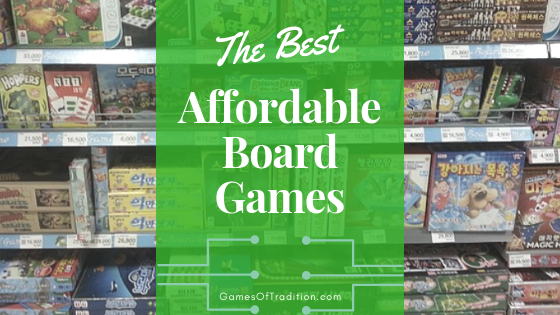 Although card games are by essence always cheaper, I want to say that the following list of best cheap board games will not only be made of card games but will also be made of proper board games. the board games all need to be under $40. Some board games being under $30 or even under $20. So, I just want to emphasis again, you don’t need to break the bank to find a good board game. It is possible to find good cheap board games. This list will help you to do so. The board games on this list might be cheap, but they are all excellent board games, fun to play and really entertaining. Ideal for Christmas stocking fillers. 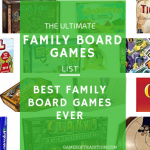 Check also my list of best family board games. All of the board games in the list are under $40 as well. I am thinking of games like Kingdomino, Hanabi, Camel Up, Jamaica, and lot of great family board games.Have a look at the best board games for traveling and my list of best board games for 2 players, you will also find lot of great board games under $30 as well. Let’s find some good cheap board games! For example the Operation Specialist can build research stations which are needed to find cures for the diseases. The Scientist needs only 4 cards of a particular disease to cure it instead of the normal 5. But the diseases are out breaking fast and time is running out: the team must try to stem the tide of infection in diseased areas while also towards cures. Splendor won many awards: It won the 2015 Nederlandse Spellenprijs Best Family Game award, the 2014 UK Games Expo Best New Boardgame and the 2014 Golden Geek Board Game of the Year award. Splendor is a great board game, fun to play, easy to teach and also easy to play. The game plays quick, it will take approximately 30 minutes to play.The components of the board games are really good quality. At just under $40 at the moment, you really can’t go wrong with Splendor. Ethnos is an area control type of board game designed by Paulo Mori, with some fantastic artworks from John Howe. It was published in 2017 by CMON limited. In Ehnos, the players are trying to get the most points by controlling different lands. The lands of Ehtnos contain 12 ancient tribes and in each game, the players have to recruit 6 of those tribes cards, then create a deck with only the creatures in those tribes.Players will band them together, and play them to gain control of one of the six Kingdoms over the course of three ages. In Ehnos, there are so many way to score points, it is just so fun. The game play very fast and you are constantly looking at what the other players do. When a player play a band, he needs to discard the rest of his cards face up for the other players. I must add that Ethnos is not only highly entertaining but also is easy to play. The game has a big replay-ability with all the different types of races in it. Overall, Ethnos is another board game under $40 that I highly recommend to try. The settlers of Catan is an agricultural trading and resources gathering board game release in 1995. Catan ( as known since the 5th edition release) is probably the most famous and well known board game of all time. It has really became a real classic board game that everyone, I think, should try. Catan is simple enough for anyone to try but it has enough strategy depth to keep people coming back for more. Players gather materials to build roads and settlements and need to negotiate with each others to get resources. 7 Wonders has so many awards that I won’t even start to list them here. It is a classic card development game, where players each receive seven cards from a particular deck, choose one of those cards, then pass the remainder to an adjacent player. Note that each time, the chosen card is played before the process repeats. Players will collect six cards before they can discard the last one.. Then we start again with new cards by changing direction with seven new cards and a third time and the game is over. Simple rules and very fast play, 7 Wonders is the ideal board game for all types of players. Get ready for a new train adventure as you travel across Europe with Ticket to Ride – Europe, the new edition of the worldwide hit from Days of Wonder. From Edinburgh to Constantinople and from Lisbon to Moscow, the game will take you on a ride to the great cities of turn-of-the-century Europe. More than just a new map, Ticket to Ride – Europe features brand new gameplay elements including Tunnels, Ferries and Train Stations. Plus, we’ve upgraded you to First-Class accommodations with larger cards, new Train Station game pieces, and a lavishly illustrated game board. Like the original, the game remains elegantly simple, can be learned in three minutes, and appeals to both families and experienced gamers. Control your own destiny by following the right path. In the beautiful tile laying path game Tsuro, all you have to do is stay on the board to win. With paths constantly changing, this is easier said than done. move wisely and achieve enlightenment and then, of course, the joy of winning when your opponents are knocked off the board. Everyone starts with a hand of tiles, featuring a twisting path, and a token. Take turns placing tiles on the board and moving your token along the path. Be careful not to bump into another token or reach the edge of the board, or you’re out. Strategically place your tiles to stay on the board while pushing others off. The path is yours to choose. Tsuro is a great tile laying game for 2-8 Players! Easy to learn and quick to Play. Replay ability is huge, every game is different. Tsuro is the Winner Of Major Fun Award And Creative Toy’s 2011 Game Of The Year Award! Castles of Burgundy was designed by Stefan Feld and is the 2012 Games Magazine Best New Advanced Strategy Game Winner. The Castle of Burgundy plays in five phases which consist of five rounds. The players collect points by trading, livestock farming, city building and scientific research. They must buy and sell goods or labor and use action tiles for building, shipping, mining, livestock and knowledge across two game boards. Castle of Burgundy is really a nice gateway board game, with a good amount of strategy but also some randomness with the dice rolling.The game is very easy and quick to learn with very little downtime between your turns. Replay-ability of Castle of Burgundy is huge, there are so many ways to win, so many options in the game. Works very well with two players. For me, The Castles of Burgundy is a fantastic board game under $30 and totally deserve to be at the top of the list of the best cheap board games. Place tiles, adorn the Palace lake, and dedicate lanterns in this beautiful, fast–paced board game set in Imperial China. Players act as artisans decorating the Palace lake with floating lanterns. The artisan who earns the most honor before the festival arrives wins the game. Lanterns is a 2 to 4 players board games that plays in about 30 minutes. It is a great board game to play with family but Lanterns will also suit strategy gamer as well. I love the simple mechanic of this game, every players gets something during each turn of the game, which keeps the players engaged all the time. And to add o this, Lanterns looks absolutely fantastic when all the tiles are on the table. Sushi Go Party!, an expanded version of the best-selling card game Sushi Go!, is a party platter of mega maki, super sashimi, and endless edamame. You still earn points by picking winning sushi combos, but now you can customise each game by choosing à la carte from a menu of more than twenty delectable dishes. What’s more, up to eight players can join in on the sushi-feast. Let the good times roll! Sushi Go Party is the 2017 UK Games Expo Best Family Game Winner. It has all the cards from the original game plus some extra (new rolls, desserts, special cards etc..) . The game allows you to play up to 8 players instead of 4 and it includes a board to track points. Sushi Go Party! is a great game to play with a group of friends or with the family. The resistance is such a fun party game to play. Simple rules, can be explained in 5 minutes, but it can take few games for a new player to understand all the subtleties. I find it has so much rhythm than werewolf , I absolutely love the theme, and the replay-ability is infinite.And most importantly, everyone plays until the end! In the not too distant future, the government is run for profit by a new “royal class” of multi-national CEOs. Their greed and absolute control of the economy has reduced all but a privileged few to lives of poverty and desperation.Out of the oppressed masses rose The Resistance, an underground organization focused on overthrowing these powerful rulers. The valiant efforts of The Resistance have created discord, intrigue and weakness in the political courts of the novena royal, bringing the government to brink of collapse. But for you, a powerful government official, this is your opportunity to manipulate, bribe and bluff your way into absolute power. To be successful, you must destroy the influence of your rivals and drive them into exile. In these turbulent times there is only room for one to survive. Coup is very enjoyable bluffing and social deduction card game. You could play with 2 players but I recommend to play Coup with 4 to 6 players, it is very fun and addictive! And again, for a game under $20, you can’t go wrong here. Choose to play as either the Rebel Alliance or the Galactic Empire, and use the classic Risk dice to control characters and ships. The object of the game is to defend or destroy the Death Star. Which side will win: the Galactic Empire or the Rebel Alliance? There is a lot of RISK version out there, but don’t let you get fooled by the name of this game. There is absolutely nothing about RISK in this game. This game is rather a successor of another game published by Habro\Avalon Hill games in 2000 called Star Wars: The Queen Gambit. Risk: Star Wars Edition is an excellent board game game to play: it is fast, fun to play, a sort of light war-game.I love all those little plastic models of X-Wings, TIE fighters, Y-Wings, B-Wing that you push around the board. If you are a Star Wars fan as many are, this is the game to get. If you are looking for a more RISK-like experience, I would suggest you try RISK: 2210 AD or RISK Europe set in medieval Europe.They are probably the best RISK games version along with the RISK Star Wars edition. Also you might want to have a look at those other strategy board games that were inspire by RISK, in this list of board games like RISK. Mancala is one of those traditional board games that has been played for hundreds and hundreds years all around the world. Ideal Classic Mancala is a Board Game with Folding Wooden Game board and glass game pieces that provides hours of entertainment and is a great way for children to learn and teach strategy. Mancala is a game played around the world, sometimes called “sowing” games, or “count-and-capture” games, which describes the game play. Players begin by placing (4) stones in each of the pits on the game board. A player may count their stones to plot the game. A turn consists of removing all stones from a pit and placing one in each of the following pits in sequence. If the last stone is placed in a player’s own Mancala, then he gets a second turn. Players may not touch the stones to count them and once a player has touched the stones, he must play them. Play ends when one player’s (6) bins are empty. Life in Port Royal is busing and you hope to do the job of your life. But take too much risk, or you will come back with nothing. Remember to reinvest part of your profits to win the favor of governors or admirals. You will have to hire people to be members of your crew, rob ships, . Try to expand your influence and you can meet the most prestigious expeditions. Can you do the job of your life? Port Royal is a push your luck style of card game design by Alexander Pfister and released in 2014. Port Royal and its cool pirate theme won the 2015 Vuoden Peli Family Game of the Year Award (Austrian Game Designers Competition). When I played Port Royal for the first time, I was surprise at how fun this card game actually was.It is a light and entertaining card game that is easy to learn.Perfect for young children and adults alike. It keeps all the players attention all the time, even when it is not their turn which is an important element for me. There is no time to get bored in Port Royal, there is a constant interaction between players.There is also an element of strategy, as you can chose to buy different type of cards with different powers. At the price of just more than $10, this is certainly a must have card game! I have only scratch the surface here on how possible it is to find a board game that is fun, greatly entertaining, that has a great game-play or theme, but still is an affordable board game at the same time. There are lots and lost of excellent board games under $40, even board games under $30 that are well worth to play. Obviously most people won’t choose a board game according to its price only, but for most people , price can be important, as money can be tight sometime. At least for most people!